Pasta Aglio Olio, simple, delicious and fast to prepare dish that you can enjoy specially if you have unexpected visitors coming to your place. My first encounter with wonderful dish was during my 4th year high school prom night. When pasta aglio olio was served to us, I’m wondering, where is the sauce. I used with the red and white sauce and seeing something that is pasta with no sauce is something new to me that time. I dig in and taste this naked pasta pasta dish and its simply delicious. It has this wonderful taste of garlic and olive oil, with pieces of black olives, chopped parsley and chicken breast on the side. I to myself that this dish is new to me and I liked it. After that night, I began experimenting to make that dish. However, during that time, I don’t know that the recipe is aglio olio recipe. I just know that it uses oil with infuse garlic to coat and flavor the pasta. Maybe you are wondering why on earth did I not search it on net. Well, its the very reason that during my high school years, I’m using a dial-up connection and we all know that in those primitive days, the internet, with a dial-up connection, would take you centuries to load. How lucky are the kids today that they enjoy internet at its fullest and at a blink of an eye. During my kitchen experiments, I’ve tried using canned tuna in oil and tossed it in cooked pasta noodle, though its not delicious as the aglio olio I had, it was great too. As the technology advances during my college days and we had a DSL internet connection, I began my serious search for aglio olio recipe. And guess what? Its just a simple minced garlic sauteed in olive oil with the pasta tossed in the garlic-oil mixture and voila, you have aglio olio on your plate. Just add some olives, parsley and even canned tuna and its good to serve. This aglio olio recipe is a simple dish that uses olive oil and sunflower oil from bottled sun dried tomatoes for added flavor as its base oil. I got a couple of chicken breast fillet in the fridge with nothing in my mind where to use it, so I just flavored it with salt and pepper and pan grilled the breast. For added texture, I added crispy canned corned beef to give this dish a little crunch. 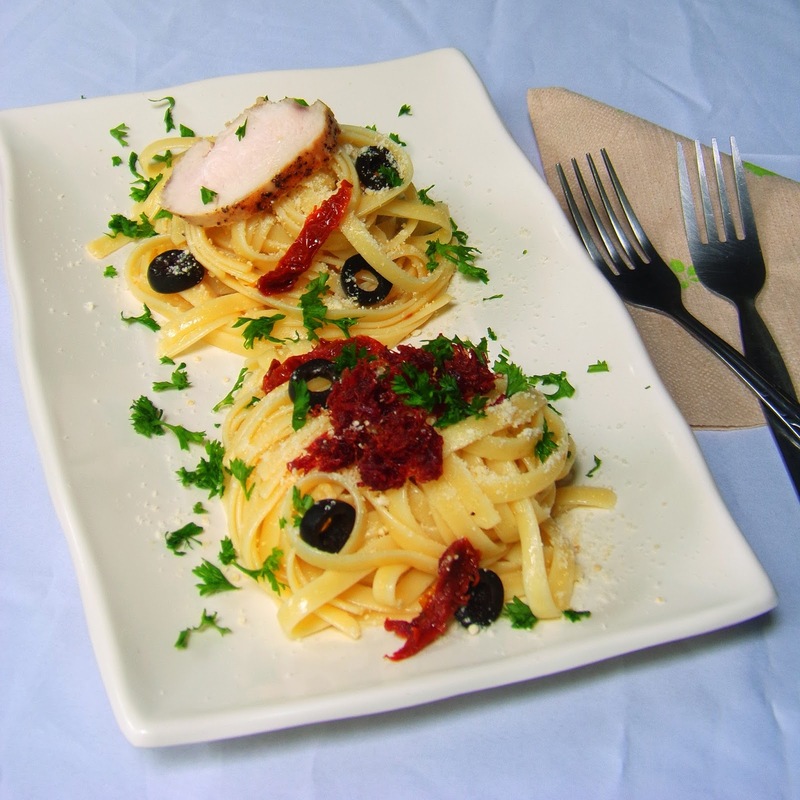 Black olives, parsley and sun dried tomatoes are added to give a harmony of flavor to the dish. Combine olive oil and sunflower oil in a pan over low heat. Add minced garlic continue cooking until the garlic is already cooked but not golden brown. You can actually smell is the garlic is still raw. Tossed in cooked pasta. To this, tossed in sun dried tomatoes, black olives and parsley. Clean chicken fillet and pat it with paper towel to remove excess water. Sprinkle both sides with salt and pepper to flavor the meat. heat olive oil in a non-stick pan and add the chicken fillet when you hear searing sound of the oil. This means hat the oil is already hot. Brown both sides of the chicken. Remove from pan and rest for 10 minutes before slicing. Tossed this to the pasta dish. Using the same pan used from grilling the chicken fillet, add the corned beef and cooked until the corned beef turned crispy. I specifically choose Purefoods brand as it turned crunchy if you continue to cooked it. I’ve tried other brands but making it crunchy is always a failure. When the corned beef is already crispy, remove excess oil, if any, and tossed to the pasta dish. Please take note to add plenty of salt in the boiling water used for cooking the pasta. Do not be afraid that your pasta would end up being salty as the pasta will not absorbed all the salt that you put in the water. That is why, if you are going to review the recipe, I did not add salt to the dish. Anyway, the fillet and corned beef already have salt in it.